^ Thomas Plummer (2005). Stahl, Ann Brower, ed. African Archaeology. Malden, MA: Blackwee Publishing Ltd. pp. 55–92. The Olduvai Gorge or Oldupai Gorge in Tanzania is one of the most important paleoanthropological sites in the world; it has proven invaluable in furthering understanding of early human evolution. A steep-sided ravine in the Great Rift Valley that stretches across East Africa, it is about 48 km (30 mi) long, and is located in the eastern Serengeti Plains in the Arusha Region about 45 kilometres from Laetoli, another important archaeological site of early human occupation. The British/Kenyan paleoanthropologist-archeologist team Mary and Louis Leakey established and developed the excavation and research programs at Olduvai Gorge which achieved great advances of human knowledge and world-renowned status. 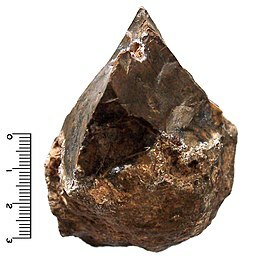 Acheulean, from the French acheuléen, is an archaeological industry of stone tool manufacture characterized by distinctive oval and pear-shaped "hand-axes" associated with Homo erectus and derived species such as Homo heidelbergensis. Sterkfontein is a set of limestone caves of special interest to paleo-anthropologists located in Gauteng province, about 40 kilometres (25 mi) northwest of Johannesburg, South Africa in the Muldersdrift area close to the town of Krugersdorp. 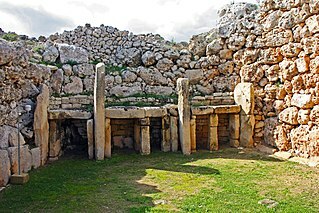 The archaeological sites of Swartkrans and Kromdraai are in the same area. Sterkfontein is a South African National Heritage Site and was also declared a World Heritage Site in 2000. The area in which it is situated is known as the Cradle of Humankind. The Sterkfontein Caves are also home to numerous wild African species including Belonogaster petiolata, a wasp species of which there is a large nesting presence. 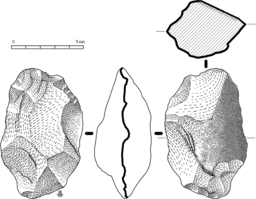 Abbevillian is a term for the oldest lithic industry found in Europe, dated to between roughly 600,000 and 400,000 years ago. 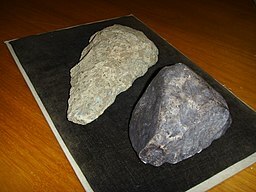 The Middle Stone Age was a period of African prehistory between the Early Stone Age and the Later Stone Age. It is generally considered to have begun around 280,000 years ago and ended around 50–25,000 years ago. 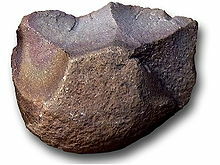 The beginnings of particular MSA stone tools have their origins as far back as 550–500,000 years ago and as such some researchers consider this to be the beginnings of the MSA. The MSA is often mistakenly understood to be synonymous with the Middle Paleolithic of Europe, especially due to their roughly contemporaneous time span, however, the Middle Paleolithic of Europe represents an entirely different hominin population, Homo neanderthalensis, than the MSA of Africa, which did not have Neanderthal populations. Additionally, current archaeological research in Africa has yielded much evidence to suggest that modern human behavior and cognition was beginning to develop much earlier in Africa during the MSA than it was in Europe during the Middle Paleolithic. The MSA is associated with both anatomically modern humans as well as archaic Homo sapiens, sometimes referred to as Homo helmei. Early physical evidence comes from the Gademotta Formation in Ethiopia, the Kapthurin Formation in Kenya and Kathu Pan in South Africa. The Bouri Formation is a sequence of sedimentary deposits that is the source of australopithecine and Homo fossils, artifacts, and bones of large mammals with cut marks from butchery with tools by early hominins. It is located in the Middle Awash Valley, in Ethiopia, East Africa, and is a part of the Afar Depression that has provided rich human fossil sites such as Gona and Hadar. 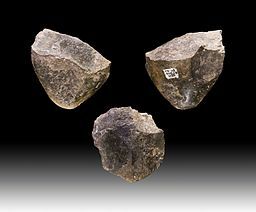 Lomekwi 3 is the name of an archaeological site in Kenya where ancient stone tools have been discovered dating to 3.3 million years ago, which make them the oldest ever found.